This news item was posted in Business category and has 1 Comment so far . 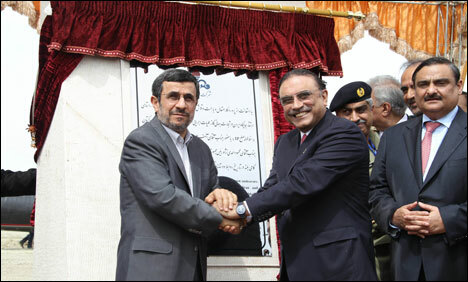 President Asif Ali Zardari and his Iranian counterpart Mahmoud Ahmadinejad inaugurated the Pak-Iran pipeline project here on Monday. A consortium will start work on $7.5 billion gas pipeline from Pakistan to Iran despite American warnings of possible sanctions, officials said. The ceremony marked the start of work by an Iranian-Pakistani consortium on the 781-kilometre pipeline earmarked for the Pakistani side of the border (till Nawabshah), which is said to cost $1.5 billion. The pipeline on the Iranian side has almost been completed. Pakistan suffers from a crushing energy crisis, but the United States says it is providing Islamabad with alternative means to help avoid sanctions. Pakistan would start receiving gas after completion of the project in December 2014. Both the presidents would also sign an accord for 400,000-barrel capacity oil refinery in Gwadar today (Monday), said advisor to PM on petroleum, Dr. Asim Hussain.